The unique reptile was discovered on the banks of a retention pond in Tanner Plantation in Hanahan. Its photograph was shared on a local Facebook page where people commented on its unusual skin tone. "I guess he used too much self tanner?!?!" said another. "It's the Trumpagator of Self-Tanner Plantation," one local joked. @postandcourier I say it got a hold on a bag of Cheeto's. My fingers turn orange when I eat them. Just a guess though. While the gator’s hue has inspired jokes, the reason for its pallor may not be so amusing. According to herpetologist Josh Zalabak, the gator’s skin tone is likely the result of an environmental mishap. “Algae – maybe some pollutant in the water, but it’s hard to say unless the water is tested,” he said. Jay Butfiloski, of the South Carolina Department of Natural Resources, said the color may have come from spending the winter in a rusty pipe. “It would not be a new species, just a genetic anomaly if it were naturally orange,” he said. 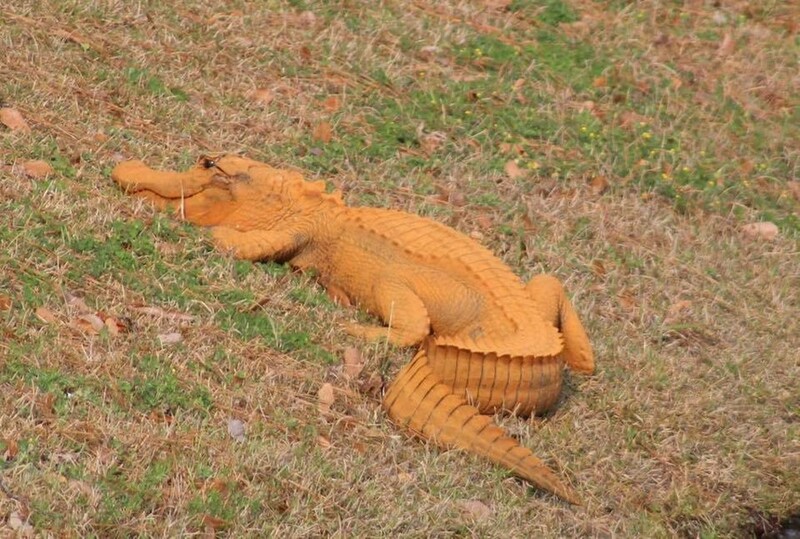 Much like a bad fake tan, the alligator is expected to soon shed its skin and its orange tone.